Posted by aquillam in Astronomy, telescope beginners guide. 12 improvements for a cheap telescope. I seem to be finding a lot of really useful websites lately that I feel the need to share. I hope you’re finding them as useful as I am. This site offers several tricks to improving a modest telescope, possibly even making something nearly useless into something useful. A wiggly mount could be the end of budding interest in astronomy, and a bad finder can make you want to chuck your ‘scope in the trash. Before you do that, take a look at these suggestions. 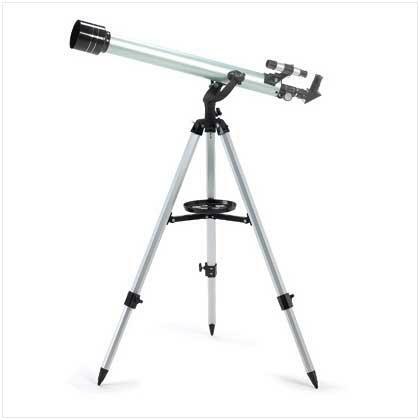 For a few dollars, you might have something you’ll be happy to take to star parties and show off. There is such a thing as bragging rights for bargain fixes. Ask one of the grey-hairs at your local club about using film canisters for camera adapters sometime! There is one things you should note though: the only fix for bad optics is to get new optics. Posted by aquillam in Astronomy, MichiganAstro, telescope beginners guide. Below is an alphabetical list of terms related to amateur telescopes. References are to other posts in this blog. I will continue to update this as I think of other terms that I haven’t included. If I missed something, let me know! Alt-Az A type of coordinate system or mount. See Alt-Az Mounts. Altitude height above the ground. See Alt-Az Mounts. Aperture Generally, the width of a telescope. It is usually the width of the objective lens or primary mirror, however some telescopes, especially older ones, may have an aperature stop that permantly limits the telescope aperture. Acromatic A lens that corrects for chromatic aberration.See Refracting Telescopes. Apocromatic A lens that corrects for chromatic and spherical aberation. See Refracting Telescopes. astrophotography Photographing celetial objects. CCDs were invented for professional observers, and are now common in digital cameras. Azimuth Direction relative to north. See Alt-Az Mounts. Barlow A special lens used in conjunction with an eyepiece to increase magnification. May also be used to mount a camera for photography with more magnification. Catadioptric A system that uses both lenses and mirrors. Usually something like a schmidt cassegrain. See Reflecting Telescopes. CCD Charge-coupled Device – the chip that makes up the ehart of a digital camera. Clock drive A device that drives an telescope on an equatorial mount to keep it tracking on an object. Technically, a clock drive is mechanical, but some people use the name to refer to any drive. Corrector or Corrector plate A sort of lens in a reflecting telescope that corrects problems like spherical aberation. See Reflecting Telescopes. Diagonal A prism or mirror that redirects the direction of light to make it easy for the observer to look through the telescope. Drive A device that keeps a telescope tracking on an object. This is easiest with an equtorial mount, but a computer controlled drive can also drive a telescope on an alt-az mount. Dobzilla A very large Dobsonian Telescope. Eyepiece the lens the observer looks though. Eye relief The distance back from the eyepiece where the observer can focus and get the full field of view. A long eye relief is especily important if you need to wear eyeglasses. Exit pupil The diameter of light coming out of the eyepiece. A wider exit pupil is easier to observe with. Field of View The area visible through the telescope. See Basic Telescope Properties. Finder ‘scope A small telescope with low magnification and wide field of view attached to a larger telescope to help the observer find objects. Focuser The thing that alows the observer to focus the image. F-ratio The ratio of the focal length to the aperture. See Basic Telescope Properties. Light gathering power A measure of the amount of light a telescope can collect. See Basic Telescope Properties. Magnification A measure of how much bigger an object appears. See Basic Telescope Properties. Meridian a reference line that runs through north and south. Astronomers usually refer to the local meridian, which passes directly overhead. When an object crosses the meridian (transits), it is a its highest altitude. See Alt-Az mounts. Objective lens The large lens at the front of a refracting telescope. The lens that points at the object. Observer The person looking through the telescope, a person who regularly looks through a telescope, or an astronomer who observes as opposed to a theorist. Pier A permanent mount for a telescope. See Alt-Az Mounts and Equatorial Mounts. Primary mirror The mirror in a reflecting telescope responsible for collecting the light. Reflector A telescope that uses a mirror to collect light. See Reflecting Telescopes. Refractor A telescope that uses a lens to collect light. See Refracting Telescopes. Resolution A measure of the detail visible through the telescope. Reticle Wires or markings in an eyepiece to help with centering or measurements. Commonly found in the eyepiece of a finder ‘scope. Schmidt A type of corrector used in reflecting telescopes. See Reflecting Telescopes. Secondary The small mirror in a reflector that re-directs the light to a position where it can be observed. See Reflecting Telescopes. Sidereal Time Time measured by the stars. A sidereal day is 24h, 56 minutes, and the local sidereal time matches the local solar time (the time on your watch) on the autumnal equinox. The RA of the meridian is equal to the sidereal time. Star trails The long curved lines that show up in long photographs of the night sky. Sucker hole A gap in the clouds big enough to convince you to get your telescope out, even though it will probably be gone by the time you are set up. Tripod A three legged mount. See Alt-Az Mounts. Wedge A device that attaches to a tripod or pier that tilts the telescope at an angle, usually to make it an equatorial mount. Alt-Az mounts work in the altitude-azimuth coordinate system. Although the words sound big, this is the one you usually use when you’re just talking to somebody. For example,a friend says “I saw this really bright light just above the horizon in the east this morning. Do you know what it was?” You reply “Of course! Venus is very bright and low in the east in the morning right now.” In this case, “low” is the altitude, and “in the east” is the azimuth. Altitude is in degrees above the horizon. It is generally assumed that the zenith is at 90º, and the horizon at 0º. Of course what you can actually see can be affected by your location: a lot of trees may limit you to within a few degrees of the zenith. Colloquially, we may also use “high” or “low” for the altitude, but since different people have different ideas about where high stops and low begins, that’s not as helpful as actual degrees. Azimuth is the direction along the horizon, such as east, or southwest. For more precise mounts, it is measured in degrees away from due north going clockwise. That means due east is actually 90º, and an azimuth of 200º would be SSE. Altitude and azimuth are shown by the blue arrows. Altitude is measured in degrees from the horizon, azimuth from due north. A telescope on an alt-az tripod. This is one of the easiest mounts to make. The most common design is a turntable with an axis for altitude adjustment. Since azimuth is along the horizon, it is important that the mount be horizontal, or level. The simplest version, or at least the cheapest, is probably cardboard box mount. You turn the box to rotate in azimuth, and rotate the telescope to rotate in altitude. The most common place you are likely to encounter an alt-az mount is a tripod for cameras or small ‘scope. a standard tripod has a mount that rotates in azimuth and has a handle for making quick adjustments in altitude. A tabletop telescope, on a Dobsonian style mount with a single arm support. 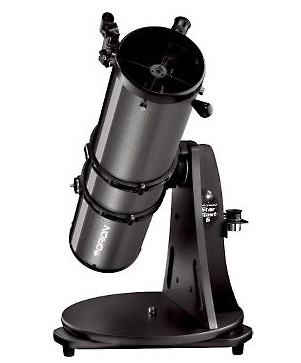 A very popular mount, especially for do-it-yourselfers is the Dobsonian. A quick search for “home built dobsonian” turns up dozens of examples. The body of a Dobsonian mount is actually just a box on a turntable. Usually, a pivot attaches to the OTA and rests in a cradle in the box. A carefully made Dobsonian may be accurate enough for setting circles and even a drive mechanism, which helps mitigate some of the disadvantages of alt-az mounts. One thing to note though is that these mounts really only work with Newtonian style telescope, where the eyepiece comes out the side of the tube near the top. If it’s a very big telescope, that may mean you’ll need a ladder to observe. Most “tabletop” scopes are alt-az mounts. Dobsonians are common because the turntable can sit on the table without adding much of any height to the telescope. The OTAs are usually light enough that only one support arm is needed. Easy set-up. Alt-az mounts are the easiest mount to set up. Dobsonian types you just plop down on a level surface, pop in an eyepiece, and you’re observing. If it’s a tripod, you’ll have to extend the legs, but you can make adjustments if the ground isn’t level. Easy to operate. They work the same way you usually think about looking for things: up and over, so beginners usually find alt-az mounts much easier to aim. Cost. As with anything, you can get some very fancy, expensive alt-az mounts. But you can’t beat a cardboard box for price. Easy to make. If you like building things yourself, a Dobsonian is the way to go. You just have to make sure everything is square and you’ll have a working mount. Star trails over the Gemini observatory. Note that the length of the trail depends on the part of the sky the star is in. Longer trails indicate a bigger change in alt-az coordinates. Tracking is hard. Unless you are observing the pole, any target you set the ‘scope on will move. Unless you are observing at the equator, the target will move at an angle, so both the altitude and azimuth will change. Even harder, the rate they change at depends on where the target is in the sky. A star close to the pole may only change 5 degrees in altitude over the course of the night, but a star that rises in the northeast may cover almost 90º over the course of the night. Images of star trails illustrate this. Near the pole, stars don’t move much over the time it takes to capture the image, so the trails are short, but farther from the pole the stars move more, and the trials are longer. Modern telescope mounts overcome this problem by having a computer control the tracking, but that means if you want an alt-az mount that will track, you’ll have to spend the money on a computerized mount. Coordinates are location dependant. The north celestial pole is at about 45º altitude, 0º azimuth for people along most of the US Canadian border, but only about 30º altitude for people on the US Mexico border. And of course, most objects change in azimuth as the night goes on. This means if you want to get the coordinates of an object like a comet, you’ll have to know your latitude and what time you’ll be looking for it. Again, the computer controlled mounts can fix some of that. The computer can calculate where it should point as long as it knows where you are and what time it is. Posted by aquillam in Astronomy, Galileoscope, MichiganAstro, telescope beginners guide. So you’ve just spent $15 on a new Galileoscope and need something to mount it on. Or maybe you just picked up your third used camera off eBay for $25 and you now have more optics than tripods. But you just can’t bring yourself to spend 3x more money on the mount than you spent on the optics. Well you’re in luck. Here’s a cheap and easy solution: a cardboard box mount. This is a very basic alt-az style mount for any lightweight optics, and it really shouldn’t cost you more than a few cents to put it together. It may not be the most elegant mount, but it works. And it doubles as a storage container! Things you need for a cardboard box mount. 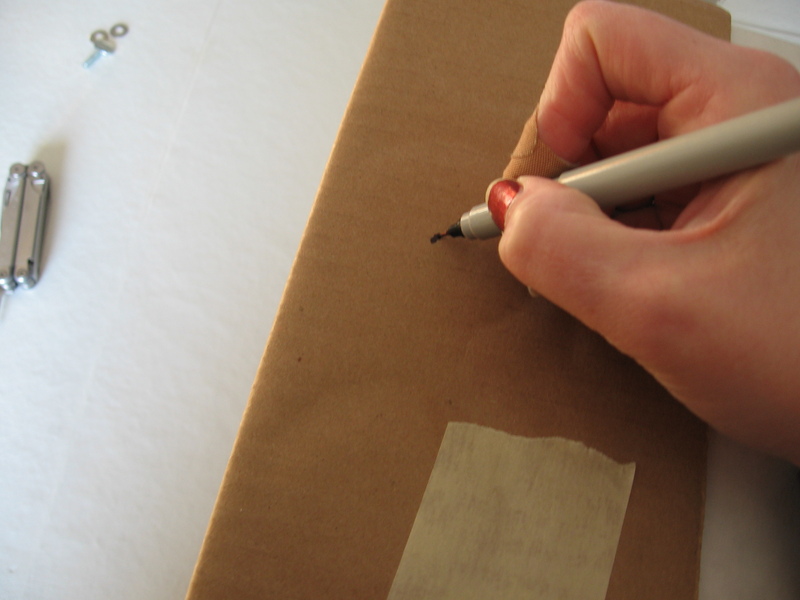 You’ll also need a pencil or pen and something pointy to put a hole in the cardboard box. The smallest screwdriver on a leatherman works realy well, though it is a bit smaller than the thread of the screw.Other good options include a small pocket knife, an ice pick, cork screw or something along those lines. Empty the box and open it up. Taping the flaps will add to the strength of the box. You will want it open while you are using it as a mount, so if it is a box with flap lids, you’ll have to decide what to do with one of the flaps, especially if you want to use it for storage. Folding the flap down will add more stability to the hole and more support for the telescope. 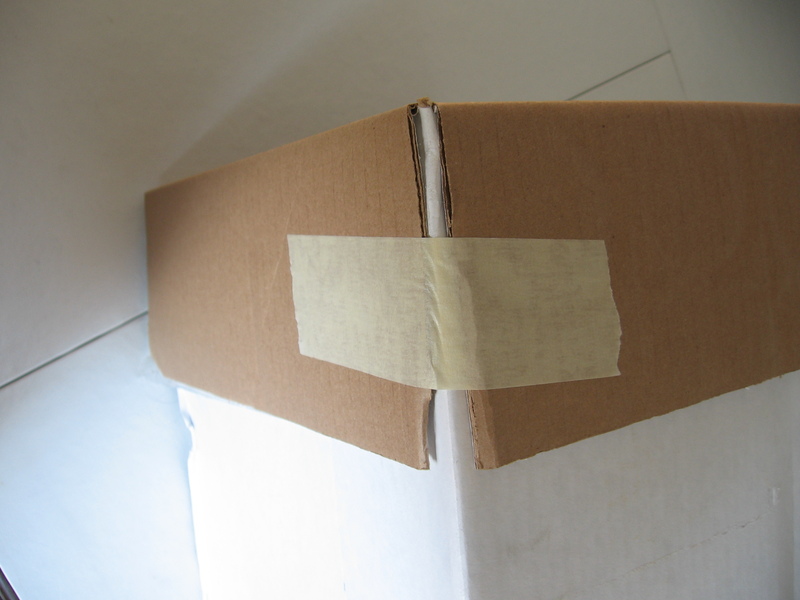 It is best to tape the flaps down to keep them out of your way while observing, but not if you want to close the box to store stuff. After repeated use, the flap will tend to fall in and become useless as part of the box top, or it may tear off. 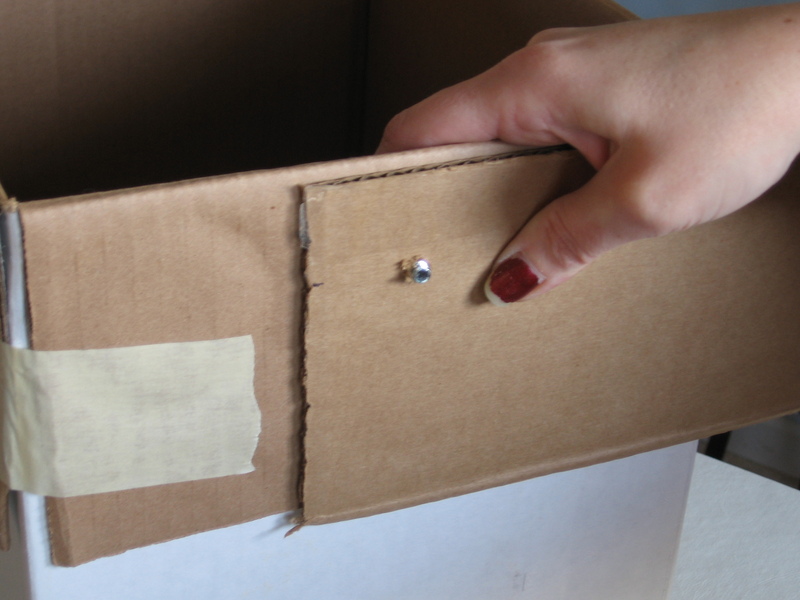 If your box is lidded, remove the lid and set it aside. Mark the location with a pen. Mark the position for the thumbscrew at least 1" from any edge or corner. The short side is better, since that will make it easier to balance the telescope. You want to to be a high as possible for a telescope, so if you are using something like a paper box, you may want to stand the box on end and put the hole in the bottom. Put the hole close to an edge to make it easier to get your head up next to the eyepiece. Make sure it is at least an inch (~2 cm) from any edge or corner so there is enough room to use the thumbscrew. Punch a hole roughly the diameter of the 1/4-20 thumbscrew. If you decide to go with something like a kitchen knife be very careful not to make the hole too big. Big holes may not have enough support for your optics. punch a hole just big enough for the thumbscrew. 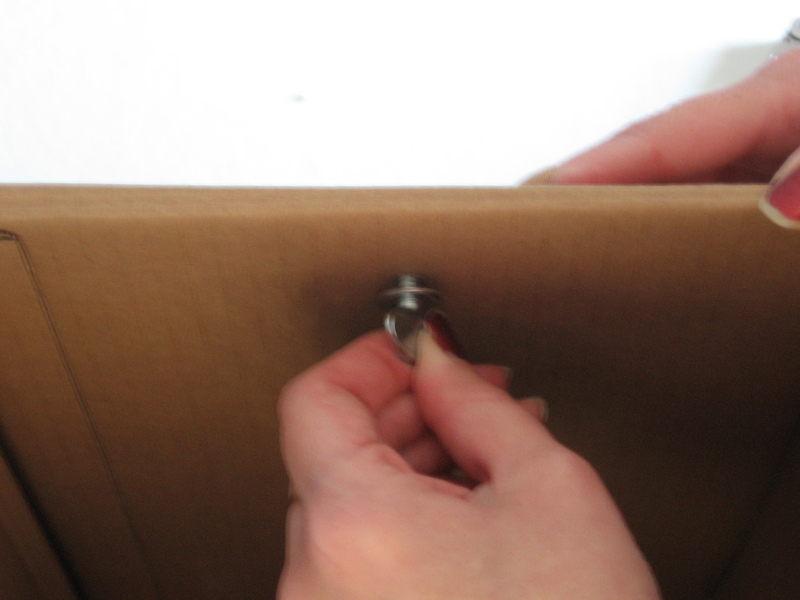 Place a washer on the thumbscrew and push the screw through the hole from the inside of the box. Place the other washer over the screw. Attach your telescope/camera. Tighten the thumbscrew just enough to hold it in place. Too tight will wear out the box. If you can’t tighten it enough to hold the telescope in place, you may need to add a couple spacers. 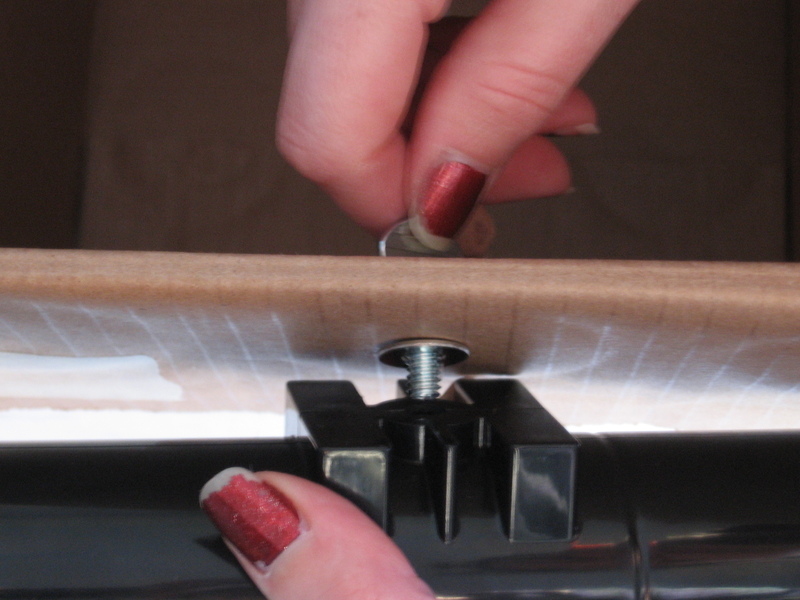 Add a spacer (or a few) to make the box thick enough to tighten the screw. Add stuff to the box to act as a counterweight to the telescope. Load the side farthest from the telescope first. 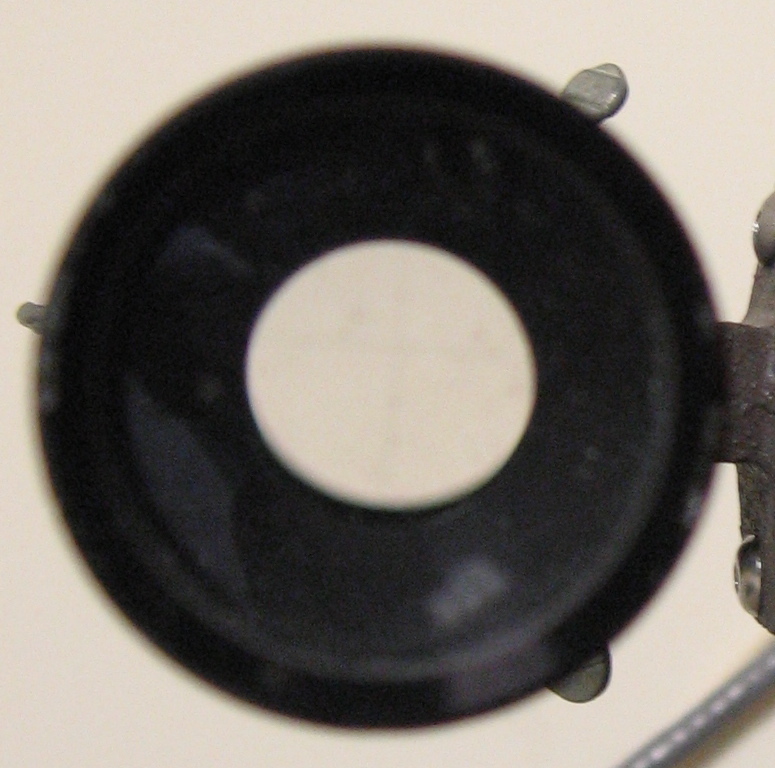 To adjust the altitude (up and down), lossen the thumbscrew slightly, adjust your telescope, then tighten it down. Moving it without loosening the thumbscrew will wear out the box. To adjust azimuth (side to side), rotate the whole box. Be sure to check the hole and the area around the washers frequently, or at least before every observing session, since there’s nothing worse than having your telescope fall off in the middle of an observing session. If the hole does wear out, simply make a new one at least an inch from the old one. When your box wears out, or if you decide it wasn’t a very good box, you can simply move the hardware to another box. 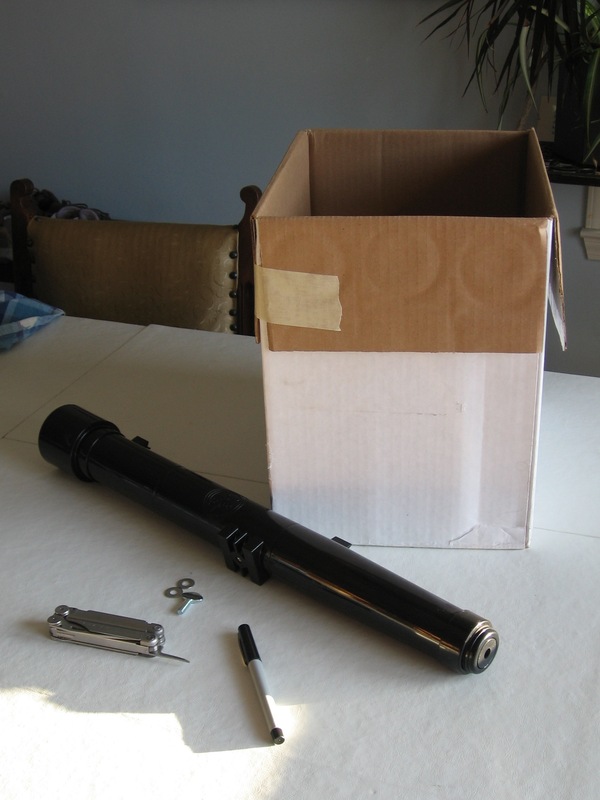 If you plan to use the box for storage, I recommend storing the hardware in a plastic zipper style bag in the box rather than leaving your telescope mounted to it. A huge box may take up too much space and be inconvenient if you want to transport it somewhere. 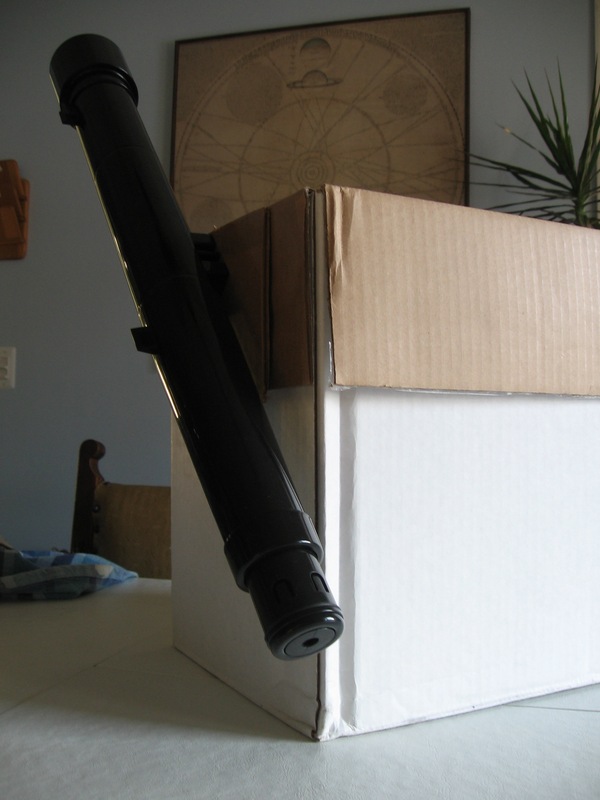 A short box may not have enough clearance for high objects and long telescopes. 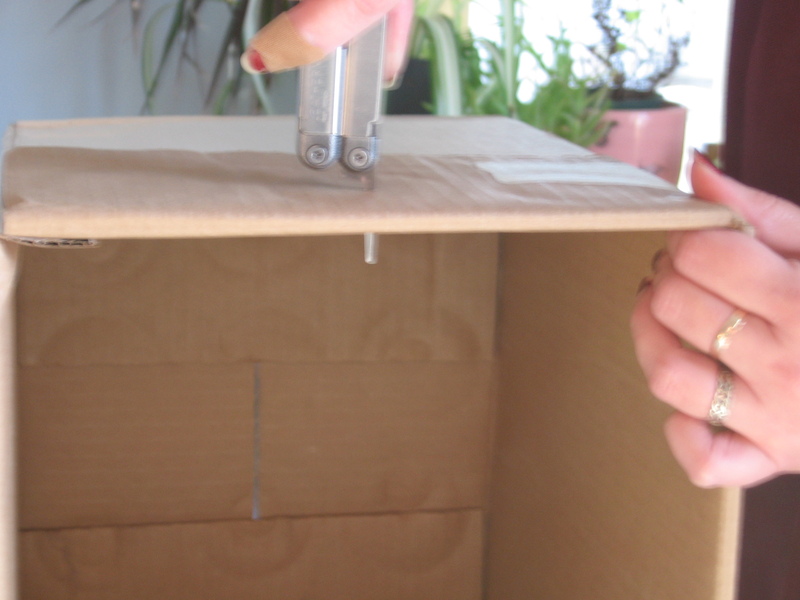 A tall skinny box may be to top-heavy to support a ‘scope or heavy camera.